Chief, I used a blade last week that blew us away. We had one sent as a demo and tested it during our recent level I & II classes. Every instructor saw first hand (sic) and then tried it ourselves. We all agreed that it was stronger than anything we’ve seen or used prior on our USAR training’s (sic) we’ve taken… We cut metal, re-bar, locks, Steel doors, then cut 6-inch concrete without a problem, then as a final test cut 1/4(-inch) steel on a building corner pillar, the concrete behind it and the re-bar inside the concrete. It cut like butter! The price is far cheaper and is lifetime guaranteed! I’d love to get two of these for Newton. This entry was posted in Testimonials and tagged Fire, Fire Rescue Safety Blades, Firefighting, Forcible Entry, General Information, Ventilation on June 18, 2014 by Desert Diamond Industries. 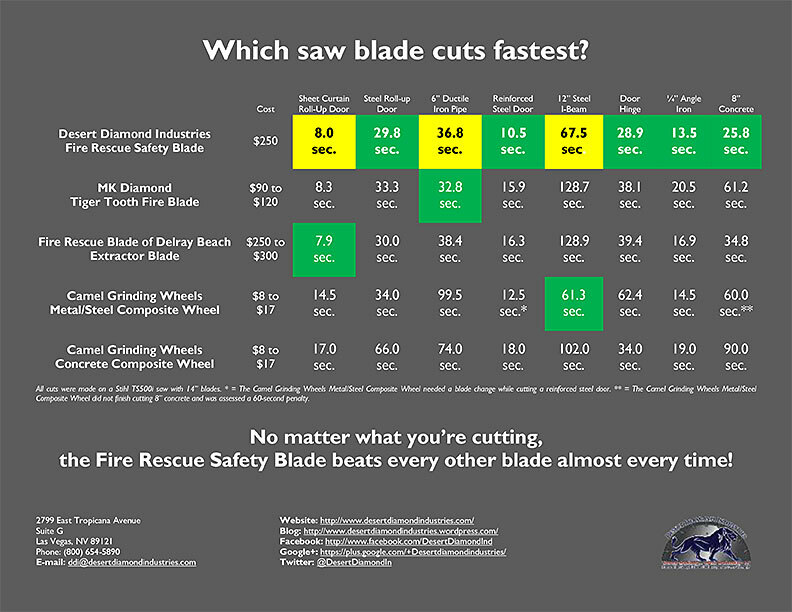 Which Fire Rescue Blade Cuts the Fastest? 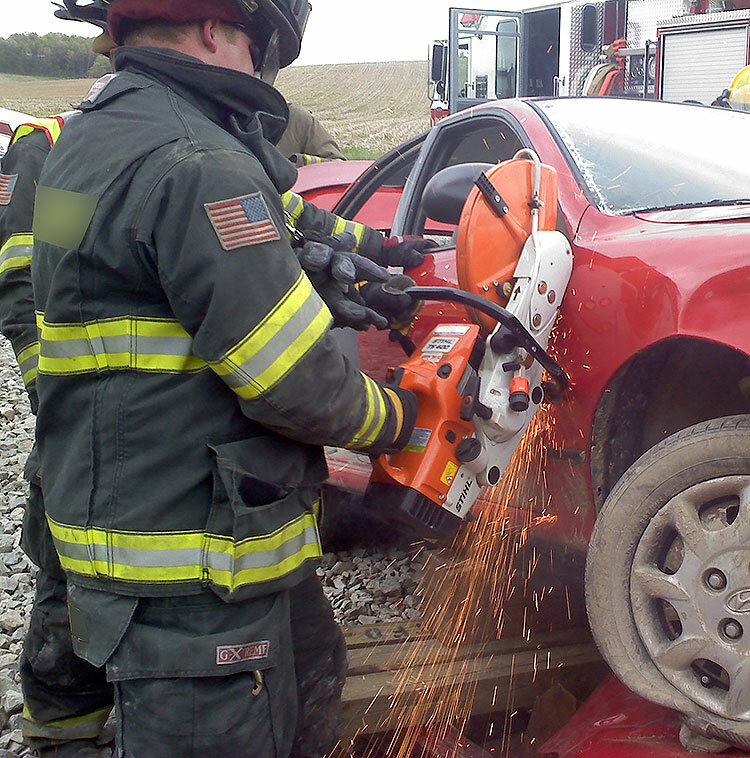 Every second counts when you’re trying to force your way into a burning structure or cut a vehicle away from a victim. You need the fastest saw blade that you can get. But which fire rescue blade is the fastest? 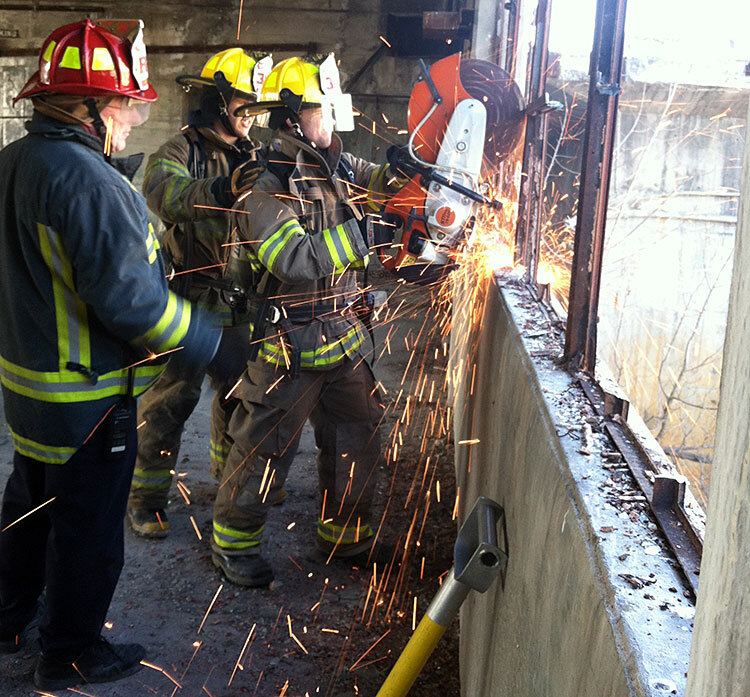 Clark County Fire Department put our Fire Rescue Safety Blade up against four competing blades to find that out. Lo and behold, the Fire Rescue Safety Blade cut fastest or came in a close second when cutting eight different materials. Click on the image below for details, or download a PDF of it now. This entry was posted in General Information and tagged Fire, Fire Rescue Safety Blades, Firefighting, Forcible Entry, General Information, Ventilation on April 23, 2014 by Desert Diamond Industries. How can you tell which structure fires need roof ventilation and which ones don’t or are too dangerous for it? Jeff Johnson of the Kansas City, MO Fire Department has the answer in his Fire Engineering article. One thing to look at is the roof, he says. The roof can give you all kinds of information about its safety and the fire underneath it, but only if you know how to read it. We’ve summed up the most important indicators in Johnson’s article in this bullet list. Smoke: Smoke rising high into the sky indicates high heat from a more developed fire and greater danger to firefighters and occupants, while smoke hanging around the eaves could indicate less heat or a fire that hasn’t made it to the upper floors. Roofing Materials: Asphalt shingles can indicate lightweight truss construction and can hide the signs of impending roof failure. Heavier materials like slate or clay tiles, on the other hand, are probably built on top of more solidly-built roofs and will need more personnel and effort to ventilate. Both can collapse at any time, so don’t take your eyes off the roof for a second, no matter what it’s made of. Dormers: A useful roofing feature for firefighters, dormers give you a look into the attic and can be used for ventilation. Skylights: Another useful roofing feature, as we’ve noted here before, are skylights. They can tell you if the fire’s worked its way up into the roof and, with a little work, can also be used for ventilation. Roof Vents: Both fixed and turbine vents vent heat from attics. Turbine vents are especially useful during a size-up because they spin faster the hotter the attic gets, at least in windless conditions. Other Roof Features: Roof features and equipment can warn you of roof collapses if you know how to read them. Keep an eye out for rain guards and flashings raised above the roof line, melting tar, or the chimney and roof pulling away from each other. These are signs for you to get your guys off the roof and maybe out of the structure. Fire District: Probably the best way to know how to vent roofs is to know what kinds of roofs are in your district! Visit construction sites, learn about existing buildings, build props and mock-ups of them, and then train, train, train. 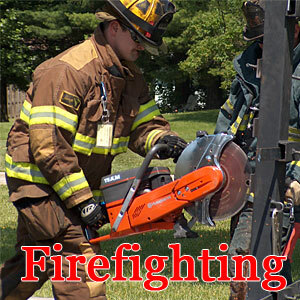 Read Johnson’s full article at Fire Engineering. This entry was posted in How To and tagged Firefighting, How To, Ventilation on March 19, 2014 by Desert Diamond Industries. We’ve had videos about how to start power saws on roofs, but we really haven’t had any that focus on how to get your saws up there in the first place. Let’s rectify that oversight right now. 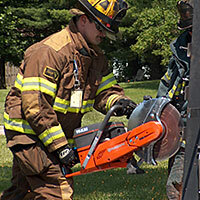 This Fire Engineering video, with FDNY Lt. Mike Ciampo, shows you how to carry saws up ladders safely both one-handed and with a shoulder strap. Win an iPad, Amazon Kindle or other prizes in our Second Annual Video Contest! See our official rules for details. 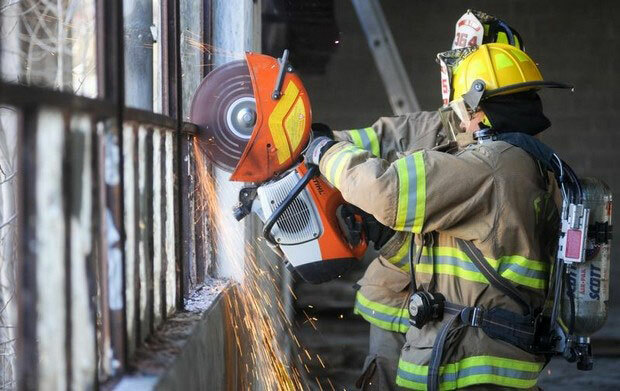 This entry was posted in How To, Safety, Video and tagged Firefighting, How To, Safety, Saws, Ventilation, Video on October 29, 2013 by Desert Diamond Industries. Fire ventilation can remove smoke, heat and combustible gases from a structure fire, but you have to do it right. That’s because ventilation introduces fresh air into a structure, which can change a fire’s behavior and even cause flashover and backdraft. Michael Lee, battalion chief at Mountain View, CO Fire Protection District and safety officer for FEMA USAR Colorado Task Force One, covers the basics of five ventilation methods over at FireRescue1. We should point out that this article isn’t a substitute for proper training. Also, before you use any of these tactics, you should determine how it will affect a fire and make sure everyone’s ready and on board with it. Natural Ventilation: Allowing heat and smoke to rise and escape a structure naturally, often through open windows. Lee recommends opening or removing windows, rather than breaking them, and working your way from the top down if you need to ventilate more than one floor with this tactic. Mechanical Ventilation: Using smoke ejectors and fans to draw out smoke. Lee recommends placing your fans where they’ll improve natural air flow without pushing smoke into congested areas. You should only use this tactic to boost other ventilation methods, for stairwell ventilation and in confined spaces with knocked-down fires. Positive Pressure Ventilation: Using fans to generate positive air pressure in an area to help draw smoke and gases out of a structure. The Venturi effect does the rest, as long as the area has one and only one exit, which must be smaller than the entrance. Lee recommends placing your ventilation opening between firefighters or victims and the fire if you use this tactic. Fog Streams: Pointing your hose out a window to ventilate a room. This is similar to positive pressure ventilation as it uses the Venturi effect to draw smoke and gases out of a room. (Our partners at Brotherhood Instructors, LLC demonstrate this tactic with a smooth-bore or solid stream nozzle in this YouTube video) According to Lee, this tactic is only good in the short-term and shouldn’t be used around items requiring protection or in cold or freezing weather. 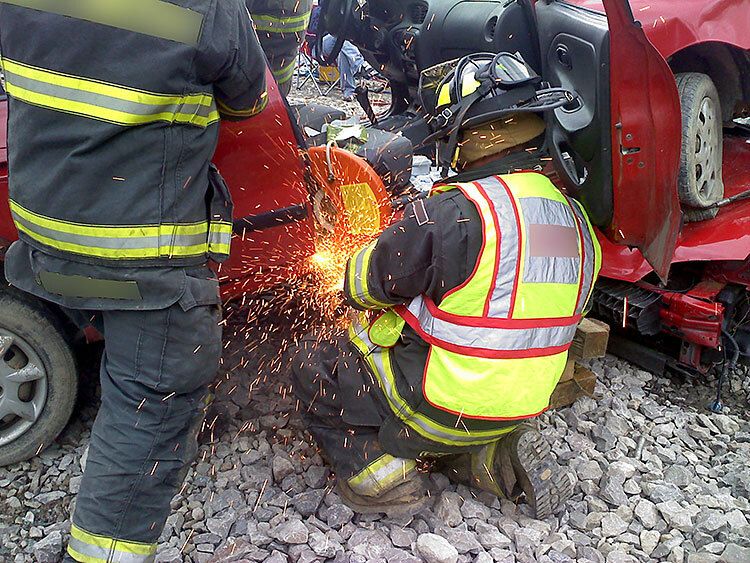 Vertical Ventilation: Cutting roof holes above the seat of the fire to let heat and smoke escape. 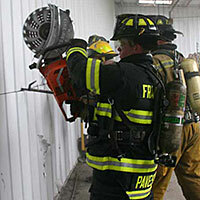 This is a favorite tactic here at Desert Diamond Industries, since we sell blades designed for vertical ventilation. However, it’s also one of the most dangerous tasks on the fireground. To increase your ventilation team’s safety, Lee recommends that they have two exits off the roof, work off of ladders to spread their weight and keep an eye out for signs of unsafe roofs, like spongy material, bubbling tar, melted snow, dry spots on wet roofs, smoke and heat. This entry was posted in General Information and tagged Firefighting, General Information, Ventilation on August 2, 2013 by Desert Diamond Industries.